Di Askwith is the chair of the Independent Monitoring Board at HMP Eastwood Park. This is a women’s prison where the IMB protect the prisoners’ human rights. Dr Jenny Earle of the Prison Reform Trust spoke about reducing women’s imprisonment. She urged Soroptimists to lobby government on the forthcoming Domestic Abuse bill. Angela Edwards of SI East Grinstead accepts the Daphne Whitmore award for ten years work in collaboration with the Ghana Education Project to advance human rights in the field of education. President Jane congratulated Hilary Rowberry for inspiring and energising SISEE programme action. President Jane thanked Jan Doyle for her years service as the regional treasurer. 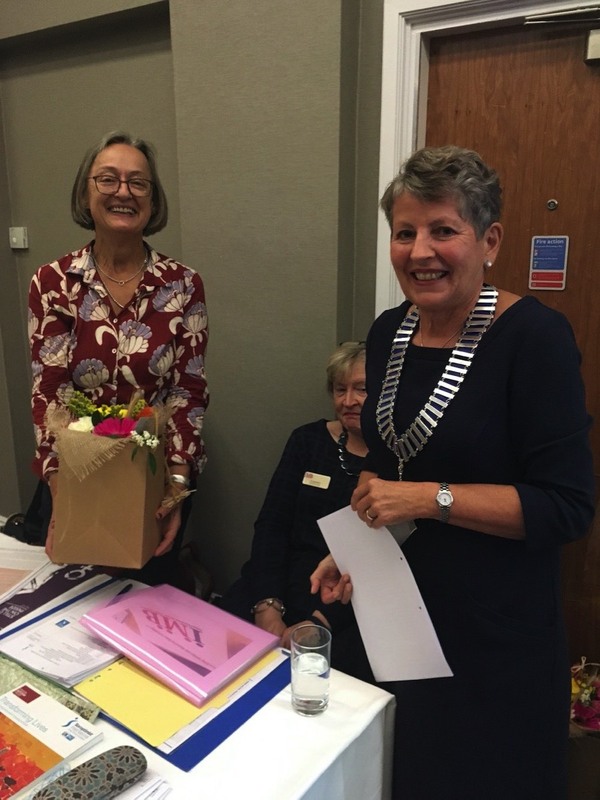 President Jane thanked Anne Hudson for representing the region at the Soroptimist benevolent fund with wisdom and discretion. President Jane congratulated Nellie Adjaye MBE of SI Maidstone and Chris Jones of SI East Grinstead for 25 years service and improving the lives of women and girls. Minute Secretary Barbara Fisher and Secretary Jeanette Lee were standing down after 12 years on the Executive Committee. They were presented with a gift and flowers by President Carol as a mark of thanks for their support to the Region. They will be greatly missed. The theme for the Regional AGM speakers was communication. Emma Cox spoke about how we can use stories about our Programme Action work to help people understand what we do and raise awareness of Soroptimist. Barbara Stevens gave an entertaining and informative talk about her year as a journalist.